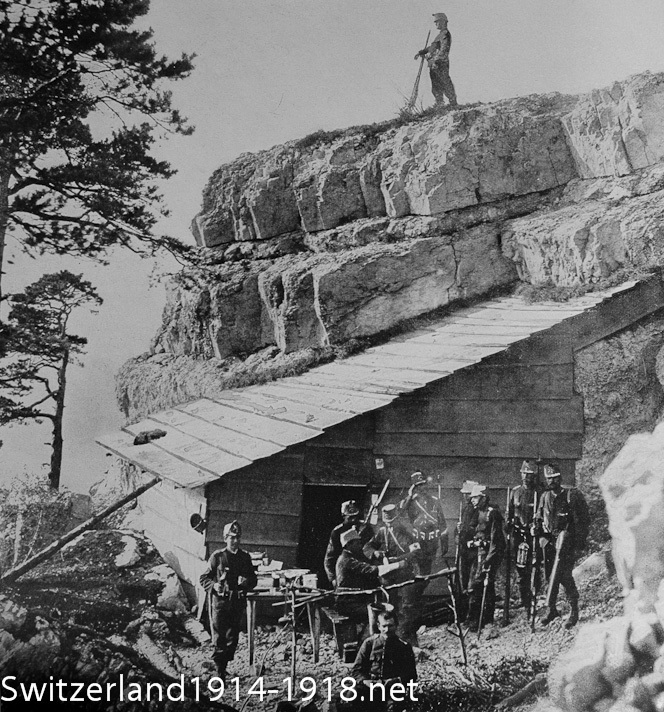 Above: Swiss troops in a trench near the frontier at the start of the war, practising to repel an invader. On the outbreak of war, north-west Switzerland was seen as the most vulnerable part of the country. Three divisions were stationed in that region, with three more in reserve. Once the Western Front became entrenched, three divisions were demobilised at any one time. The need to man the frontiers in strength was now less apparent than at the outbreak of war, and there was some dissatisfaction amongst the troops at having to do so. 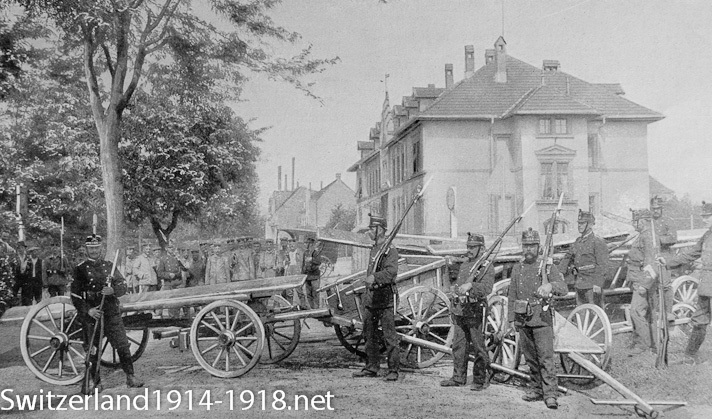 A temporary barricade set up on the Swiss-German frontier at the start of the war. German troops can be seen in the background. Whatever the tensions at an international level, things seem relaxed at this local level. 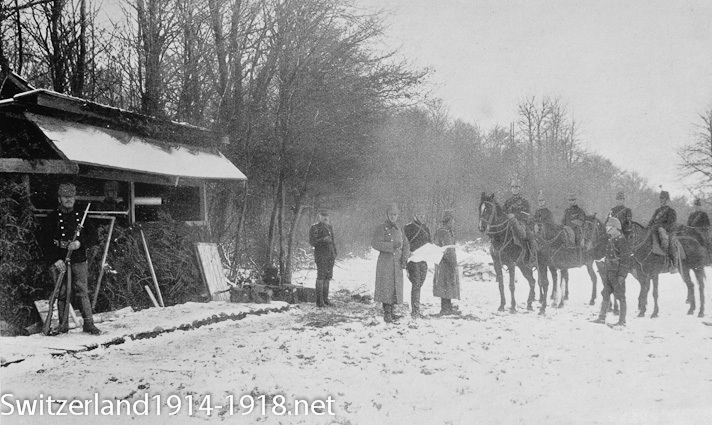 A guard post near the Swiss-French frontier. Cavalry (on right) were useful for patrolling the border areas. 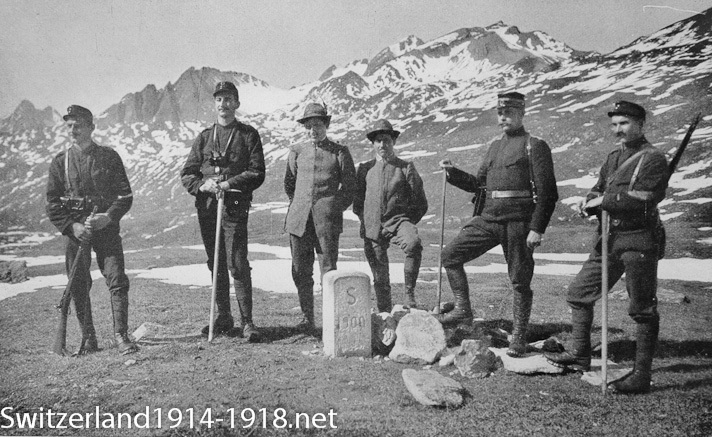 Swiss and Italian troops at the meeting point of their borders. The Italians are the two gentlemen in the middle. Again the atmosphere here seems very relaxed! This photograph may well have been taken while Italy was still neutral, before she entered the war on the Allied side in May 1915. 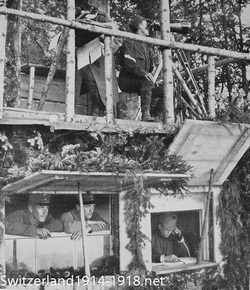 A guard post watching the frontier. 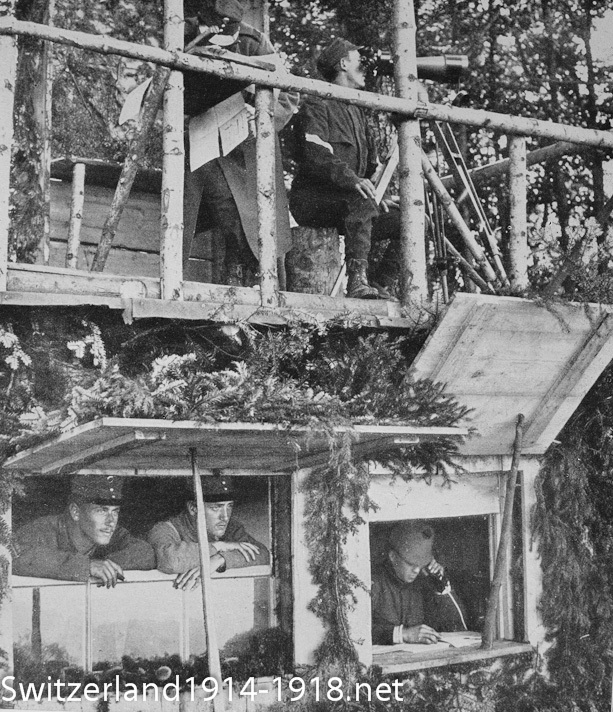 A camouflaged observation post near the Swiss border. Note the soldier at bottom right using the telephone. Elsewhere on this website: Read more about the Swiss frontiers in the First World War, or about the point where the Western Front met the Swiss border. Click here to go to the next page on the soldiers' life.